Can I still wrap these in bacon? Yes. How many times have you looked at pigs in a blanket with a side-eyed glance, secretly wishing those blankets were made of bacon — pigs in a pig blanket, if you will? 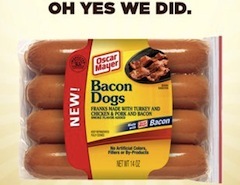 Maybe often, perhaps never, but fans of all things pork are surely rejoicing at the news that Oscar Mayer is debuting bacon hot dogs this summer. Yes, you read that correctly — hot dogs with the flavor of bacon. No need to wrap your pork in pork by hand, in other words. Kraft Foods says the bacon dogs will be on store shelves in time for the Memorial Day grilling season kickoff , and will be available around the country. Other hot dog iterations are also in the works, including a gluten-free chicken-breast hot dog and a larger version of the Smokies smoked sausages. Of course, these hot dogs aren’t just ground up bacon (sigh) — the ingredients tout no artificial flavors, fillers or by-products, but include mechanically separated turkey, chicken, and pork as well as bacon pieces. *Full disclosure: Hot dog director is my dream job. Or perhaps Deputy Chief of Cheese. Next Is The “Waffle Taco” Really A Taco, Or Just A Folded Waffle With Stuff In It? Next Up: Is The “Waffle Taco” Really A Taco, Or Just A Folded Waffle With Stuff In It?